After-Market Accessories for full-size street scooters. Parts for such as Haynes repair manuals, plastic repair kits, all-weather covers, tire patch kits and much more. Replacement parts for 36v full-size street-legal electric scooters. 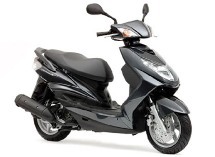 Parts for scooters with 150cc and 125cc GY6 QMI152/157 QMJ152/157 4-stroke engines. This is the most popular 150cc automatic engine found in 150cc and 125cc Chinese and Asian made 4-stroke scooters. Parts for scooters with 250cc 4-stroke CN250 water-cooled 172mm engines. This is one of two main 250cc engine types used in Asian made scooters. The parts in this category are for the motor designed and modeled after the Honda CN250 water-cooled Honda Helix engine. The second type is designed and modeled after the Linhai Yamaha 260cc engine. Parts for scooters with the 50cc 2-stroke 1PE40QMB Minarelli based engine. This engine is used on other European and Asian made scooters and vehicles from Taiwan, Korea, Europe and America. Parts for scotoers with 50cc 2-stroke D1E41QMB02, D1E41QMB, H1E41QMB and 1E41QMB model engines. This motor is used on many popular Chinese scooters including the Qingqi QMQT50-B2. Stock parts, performance parts and accessories for Aprilia Scooters. Parts for Baja Motorsports brand scooters and vehicles, including the Sun City 150 (SC150), Sun City 50 (SC50 / SC50P), Baja Retro (RT50-R) and much more. Stock parts, performance parts and accessories for Baotian brand Scooters. BT50QT-7, BT50QT-8, BT50QT-9, BT50QT-11, BT125t-2 and many more. Stock parts, performance parts and accessories for BMW C1 125cc and 200cc Scooter Parts. Stock parts, performance parts, and accessories for Honda Scooters. Stock parts, performance parts, and accessories for United Motors Brand Scooters. Vento Triton R4, Zip R3i, Phantom, and Sauron Scooter Parts, Accessories, and Performance Parts. Stock parts, Performance parts, and Accessories for Yamaha Scooters.